Alright, alright, you’re probably wondering how a title that has to do with breakfast cereal (and is even part of its branding, really) is connected to something sobering like deterioration of Antarctic ice sheets or earthquakes. See, according to Einav and Guillard, the authors of this week’s OPEN ACCESS Featured Article, “the substitution of subject materials by surrogate materials has been widely effective in science.” This makes sense as a model can help explain what might happen, but scale could be a problem: a small, 1-pound chunk of Antarctic ice sheet might not have the same pressure and cracking properties as, say, a chunk the size of a city block when they melt due to warm water. They didn’t really go into what was the light-bulb moment was when they realized they could simulate this using Rice Krispies cereal (‘puffed rice’ cereal – mind the branding, please), but it makes one wonder what was the light-bulb moment. Anyway, there are a lot of calculations to wade through (but feel free to check the article if you’re up on your maths), but the overall experiment goes as follows: water seeps up through a layer of porous stone in the bottom of a cylinder. This water wets the bottom of a rather thick layer of puffed rice, which simulates things like ground water or ocean water at the bottom of an ice shelf. Above the puffed rice is a mechanism that adjusts the amount of pressure (‘load’) applied on the puffed rice, simulating pressure from simply having lots and lots of rock/soil far above the wetted, compromised ice or rock layer. 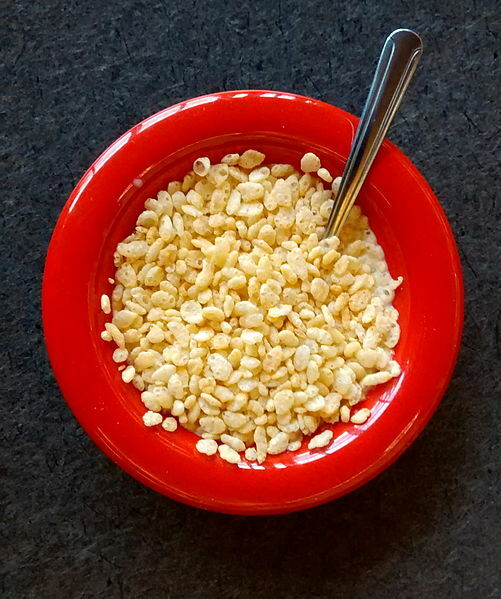 Interestingly, they found that not only did it temporarily and regularly reduced stress (which came back) on the puffed rice, these drops in stress could also be heard, probably not unlike what you get with a seismometer. Snap, crackle, and pop indeed. Thus, the modeling of rock/ice stratum collapse through the concept of ‘ricequakes’ was deemed successful – it produced consistent, linear results about the relationship between the dynamics of collapse with the pore size of the stratum. Your cereal stays crunchy, even in milk, but I think that’s probably why ice shelf collapse happens in a matter of seconds; it’s due to the mass above the compromised layer of ice and the weakening of the ice sheet due to warmer water. Have a happy breakfast! Thoughts? Comments? Insights from your favorite breakfasts? Let me know in the space below, throw a like if you liked it, and you don’t need to be a WordPress member to do it! If you’re not doing so already, please follow (if you’re into scientific research with snarky commentary anyway) and thanks again for stopping by. I don’t know what kind of insight I’m going to get out of my breakfasts, which is usually oatmeal with cocoa power, peanut butter, a bit of Stevia, and maybe a banana, served with vanilla caramel tea – all I know about it is that I make it, I leave it in my home office, I close the door, I take my morning shower, and when I open the door, the out-rushing air hits me with the smell of peanut butter cups. I can’t use it to explain geostratum collapse, though. Featured Article: Einav I, Guillard F. (2018). Tracking time with ricequakes in partially brittle porous media. Science Advances 4(10):eaat6961. DOI:10.1126/sciadv.aat6961.